FOR the better understanding of the matter treated of in the following pages we deem it well to give the reader a brief account of the Liturgies in use in the Eastern and Western Church at the present day. To give anything like a full history of the various Eastern Liturgies would, indeed, be a very laborious undertaking, and, we have serious reasons to fear, a very unsuccessful one also, for their name is legion—the Jacobites alone using as many as forty. We shall, therefore, wholly confine ourselves to such as are in general and daily use, and leave the rest to be treated of by those writers who make pure Liturgy the burden of their writing. It would not be very bold to assert that the only living Liturgies in free circulation throughout the East at the present day are those of St. John Chrysostom and St. Basil the Great. Both of these are used now in their entirety, such as they were when they came from the hands of the great men whose names they bear; and this can be said of none of the other Eastern Liturgies. The Liturgy of St. Basil is very often called the Cæsarean Office, from the fact that its author was Bishop of Cæsarea, in Cappadocia. It is the parent of the Armeno-Gregorian Rite. The Liturgy of St. Chrysostom is usually inscribed “the Divine Liturgy of our Holy Father among the Saints, John of the Golden Mouth.” From this many of the later forms in use among the Nestorians are derived. The Liturgy of St. James, first Bishop of Jerusalem, is very frequently spoken of in connection with the Maronites and Syrians, but it is a well-known fact that the living Liturgies of both these peoples have little more of St. James’s in them than a few shreds. The Maronites are very fond of referring their Liturgy to that venerable norma because it has the impress of antiquity, it being the general opinion of liturgical writers that it is the oldest in existence; but in reality their Liturgy as it stands now is nothing else but a collection of excerpta taken from other Liturgies, and as often called by the name of St. John Maro as by that of St. James the Apostle. The fact is that, if we except the Church of Jerusalem and a few islands in the Archipelago which employ it on certain occasions, the Liturgy of St. James has no circulation to-day in its original form anywhere. The same may be said of the Liturgy of St. Mark, at one time in exclusive use throughout the Patriarchate of Alexandria, and, in fact, of every other primitive Liturgy known; so that we repeat what we stated at the outset, that the Liturgies of St. John Chrysostom and St. Basil the Great have almost undisturbed sway in the East to-day. They are used by Catholics and schismatics alike. Dr. Neale attributes all this to the influence of Balsamon, Catholic Patriarch of Antioch in the beginning of the thirteenth century, who, it appears, went heart and soul for shaping everything Eastern by the standard of the New Rome. Although Neale speaks somewhat disparagingly of this learned prelate, still, as he tells the story in full of how the Liturgies of Constantinople made their way into the East, we give his words without change of any kind. He speaks as follows: “Of the normal Liturgies, those of St. James and St. Mark were used by the churches of Antioch and Alexandria, respectively, till the time of Theodore Balsamon. This prelate was a complete Oriental Ultramontane; everything was to be judged by and squared to the rule of Constantinople. The Bellarmine or Orsi of the Eastern Church, he was for abolishing every formulary not adopted by the œcumenical patriarch, and endeavored successfully to intrude the forms of Constantinople on the whole East. Consulted by Mark of Alexandria as to the degree of authority which attached to the Liturgies of St. James and St. Mark, he wholly condemns them as not mentioned by Holy Scripture or the Canons, ‘but chiefly because,’ says he, ‘the Catholic Church of the most holy œcumenical throne of Constantinople does in nowise acknowledge them.’ The way in which Balsamon treats these offices, more venerable than his own, and that in which Rome has abrogated the Gallican and Mozarabic missals, are surely marvellously alike. From that time the Constantinopolitan Liturgies of St. 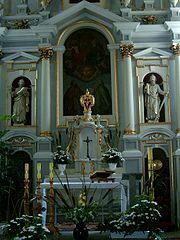 Basil and St. Chrysostom have prevailed over the whole orthodox East, except that the Office of St. James is used in the Church of Jerusalem and in some of the islands of the Archipelago on the festival of that Apostle” (History of the Holy Eastern Church, General Introduction, vol. i. p. 318). To enter, then, into more specific detail, the Liturgy of St. Chrysostom is used, first, by the Russian Church in the empire of Russia itself and throughout all the imperial dominions; not, indeed, in its Greek form, but in the Sclavonic, for that is the liturgical language in all those parts. It is also used in the kingdom of Greece and its dependencies, and has universal sway among the Mingrelians, Wallachians, Ruthenians, Rascians, Bulgarians, and Albanians, as well as with all the Uniat or Melchite Greeks of the four Patriarchates of Constantinople, Alexandria, Antioch, and Jerusalem. The United Greeks of Italy and those of the Austrian Empire use it also. Together with this Liturgy, in all the places mentioned, runs that of St. Basil the Great, but it is not called as often into requisition. The Liturgy of St. Chrysostom is employed throughout the entire year, on week-days as well as on Sundays and festivals, with the following exceptions: viz., the vigils of Christmas and the Epiphany, the Feast of St. Basil (January 1), all the Sundays of Lent except Palm Sunday, Holy Thursday and Holy Saturday. On these excepted occasions the Liturgy of St. Basil is used, and on the ferial days of Lent the service of the Presanctified—called also the Presanctified Liturgy—is used instead of both.